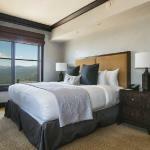 Situated in Tahoe National Forest in Truckee California this luxury accommodation features on-site dining and a spa. Each guest suite boasts a gourmet kitchen and spa bath. Each spacious suite at Constellation at Northstar features a large flat-screen TV with cable. Offering panoramic mountain views each dramatic suite is amply furnished. Northstar-at-Tahoe Mountain & Village is 10 minutesâ?? gondola ride from this accommodation. Lake Tahoe is 15 minutesâ?? drive away.